**New for 2015. Sharp’s LC-43UB30U 43-inch LED backlit 4K Ultra HD TV is Sharp’s lowest priced 4K TV Series for 2015. The UB30 Series includes Sharp’s best Revelation™ 4K Upscaler to watch current 1080p and 720p content on your 4K TV upscaled to near 4K quality. Dynamic contrast is 4,000,000:1. 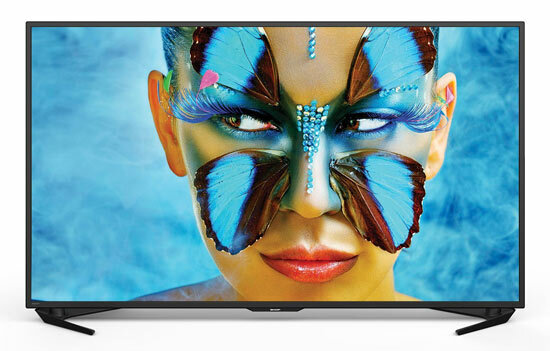 This 4K Resolution TV has four times the resolution of Full HD with (8 million pixels) Versus Full HD TVs (which only have 2 million pixels). 3840 x 2160 LED Panel. This is about the same resolution as movie theater 4K projectors. Included on this TV is a native 60Hz panel with AQUOMOTION 120Hz (Effective) anti-blur technology. MHL® Compatible along with Miracast Technology allows you to view pictures and video and other content from or to your smartphone or tablet. Remote Control App. Smart TV Apps: With the upgraded SmartCentral™ 3.0 Smart TV you have a full array of Apps and movie choices through a user friendly and customizable interface. You will have access to Netflix, Amazon Prime, CinemaNow, Skype, Vudu streaming video and customized Internet content (including Facebook, Pandora, Twitter). Just plug in an ethernet cable, or use the built-in wireless WiFi 802.11b/g/n. 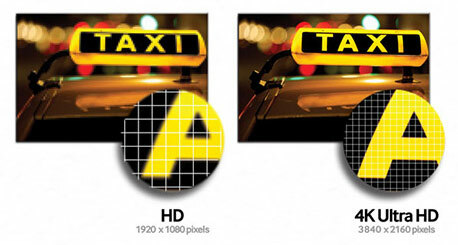 HDMI 2.0 allows 4K playback (up to 60 fps). The latest built-in HEVC(H.265) and VP9 codecs for streaming 4K content. The Sharp LC-43UB30U is Energy Star compliant. It has ATSC with QAM digital TV tuners built in. 1 Component video input, and 4 Native 4K HDMI 2.0 inputs for connectivity for DVD players, Blu-ray, PS3, Camcorders, PCs and a range of other digital devices. 2 USB ports for digital photo/video/MP3 playback, Ethernet port, Built-in Bluetooth®, and HDCP 2.2 support. Sleep Timer. Sound is provided by a 20 Watt Audio System. New Wallpaper Mode, turns your TV into a 4K photo frame, so your screen blends into your room’s decor. Display family photos with a museum-like effect while your TV is switched off. Smart-Review Commentary: Sharp’s entry level LC-43UB30U UB30U Series 4K Ultra HD TV is Sharp’s lowest priced TVs for 2015. With Four times the resolution of HD (8 million pixels), a great upscaler for viewing non 4K HD content, you have a great high resolution screen TV at a lower price than many other 43-inch 4K TVs. The resolution of this TV is about the same as a movie theater, which uses a 4K projector. The UB30 Series has been upgraded with a Quad Core Processor for faster Smart TV operations, an integrated Web Browser, ability to use Bluetooth® mouse and keyboards, and many popular Apps. You will be able to access Facebook, Twitter, Netflix, Amazon, Vudu, YouTube, and more. You can also receive content from your IOS or Android phone or tablet. The Revelation™ 4K Upscaler will upscale current content to near 4K Ultra HD, allowing you to enjoy your TV now, and in the future when more native 4K content arrives. A USB media player can display your pictures, videos, or music by plugging in a USB drive. This is Sharp’s third generation 4K TV, and they have reduced the weight substantially. Although low cost, this 4K TV comes with the latest standards such as, HDMI 2.0, a HEVC (H.265) decoder (to stream native 4K content through Netflix , Amazon Instant Video and other providers), and also includes HDCP 2.2 support. This model has already received outstanding consumer reviews. The Sharp LC-43UB30U is a Smart-Review Top Pick and top value from a major brand for 4K TVs for 2015.